* Historic Sea Captain’s home - Thriving Seaport Village * Think about Spring Break & Summer Holidays* NEW Availability Wooden Boat Show Mystic Seaport. Cheerful & sunny. Ideal for extended family, couples & celebrations, reunions & wedding accommodations. This Italianate Victorian home restored by Owners, both architects, is well located for many activities. Tall ceilings, gracious rooms, large windows, striking detail & plank floors evoke a prosperous period in Mystic's Seafaring Heritage. 4 colorful & light-filled rooms on each floor enjoy views in 2 directions & 3 grace the wing. Step from the fully-equipped kitchen to a covered porch with dining for 4 & the garden with seating for more. Relax & visit in the large parlor, formal or informal dining room, porches or yard. Enjoy morning coffee rocking on the front porch as the sun rises. Pick 1 of 5 bedrooms, all with private bath on the 2nd floor. Our home is ready for your arrival be it a Summer Vacation, Fall Retreat, Winter Holiday or Spring Break. PLEASE note (as it may not be clear on this ever-changing site) that our rates are based on 8 guests & an additional amount will be shown on the quote for additional guests. We are interested in your Inquiry: . . . . Please email & let us know if you are familiar with the Mystic & the area, the number and complement in the party and any other information which will assist us in responding. We enjoy sharing our home with others who appreciate historic houses and visiting a seaport village in a region which offers a rich history, culture, nature, water and other activities. . . . Mystic is a desired location for WEDDINGS with many fabulous possibilities from wineries to historic locations. Terrific FOOD catered by regional chefs. Abundant year round pastimes and recreational options for guests. 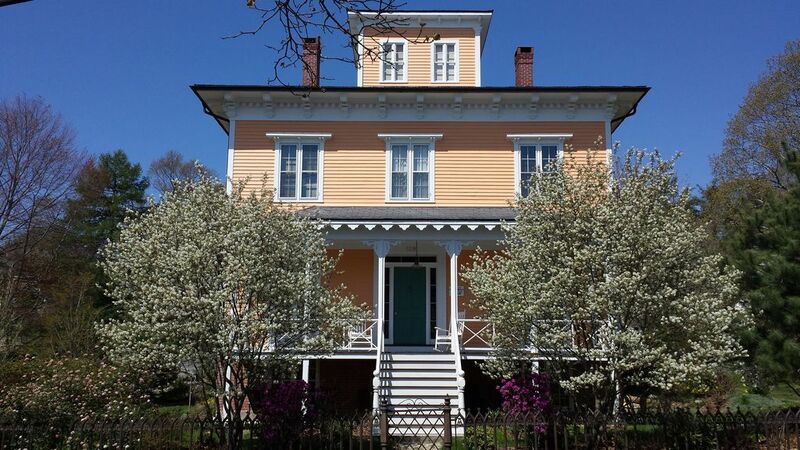 The 1853 CAPTAIN WHEELER HOUSE is ideally suited for families of the bride or groom and wedding parties. . . . . Mystic continues to be included in national and regional topical recommendations as one of the best towns to visit for many reasons: historic seafaring village, historic character, seafood, cultural options, boutiques, galleries, first-class foodie destination, top-notch breakfast spots, eating on the water's edge. The 1853 Captain Wheeler House - Mystic Vacation Activities - Many things available in the area! MYSTIC Seaport events: April ; Pirate Days - May ; LOBSTER Days & Rumrunner Lighthouse Cruise - June: SEA MUSIC Festival, WOODEN BOAT Show & small craft weekend - July 4th Independence Day Celebration, Antique and Classic Boat Rendezvous - August: Model Yacht Regatta, Antique Marine Engine Exposition - September: Coastweeks Regatta, Marine Art Exhibition & Antique Vehicle Show - October: Columbus weekend Chowder Days, "Painting in Plein Air", Celestial Navigation & Beer Tasting - for the Holidays - LANTERN LIGHT TOURS, Community Carol Sing & Holiday Magic. Community & Area Events: Mystic Outdoor ART Festival FIRST Weekend in August - Taste of Mystic, Olde Mistick Village - Argia Twilight Cruises, sail Fisher's Island Sound - Submarine Force Museum & USS Nautilus - USCGA - Coast Guard Academy & Tall Ship US Coast Guard Barque EAGLE - Garlic Festival, Sept - Mystic Eats Riverside Food Festival, Sept - Winery Visits: Stonington Vineyards, Jonathan Edwards & Saltwater Farm. One of us enjoying the opportunity to skipper on a friend's yawl. The other is below making lunch. We believe that a well-designed garden is an essential element of the house for guests to enjoy and continue to develop it with a variety of specimen trees, shrubs, perennials & flowers. We fell in love with this wonderful house and believe that our guests will love it too. The historic and architectural character of the town and its buildings held a special appeal to two architects whose practice has focused on the restoration of historic properties, commercial and residential, for 30+ years. The house is in a protected historic district filled with a variety of well preserved early homes and the village maintains its character as one built on seafaring and boat building. We have a chance to practice our horticultural skills on a garden rather than the roof of our townhouse. However, there never seems to be enough room for all the trees and shrubs we admire. Mystic is conveniently located and on the Boston/NY Amtrak line. It is wonderful, friendly village with all the requisite services and offers many opportunities for relaxation and intellectual stimulation. Of course, the Mystic Seaport Museum (just a mile walk through the village and across the river) and ready access to to the great sailing waters in the environs were a great draw to us as well. We don't really consider this a vacation home as we live here much of the time. However, we love to share it with others who will care for it in our absence while they explore and enjoy what the area has to offer. One seems never to have enough time to do what they choose to do while visiting because there is such a great choice. Our home has particular appeal to multi-generation family gatherings for a number of reasons. It is big enough to offer comfortable accommodation with 5 bedrooms, each with private bath, plus the cupola. It is also a short walk to the village so different age groups can roam at ease without relying on a car. Parents can take young children to the playground while others shop or just relax. Couples on annual getaways also like to visit and take Vineyard tours, try the many restaurants, visit the nearby museums, take a day trip to Block Island. It seems guests love to congregate at the house or in the garden visiting and reading and then go off in different directions pursuing a selected activity be it fishing, walking, antiquing, choosing a beach, biking, birding, or attending one of the many local events at the Mystic Seaport Museum or in town like the Taste of Mystic or the annual Mystic Outdoor Art Festival. The third floor double bed room in the 'Lantern' must share a private bath on the second floor. Active, period seaport village. A couple of miles inland, back roads, historic farms & landscapes are characteristic. 4 miles along River Rd, Clyde's historic steam-powered cider mill beckons all. Recreational Mystic River & Scenic River Road are nearby & readily accessible for kayak launching, walking & biking. Prominent historic district home with varied seasonal views over harbor & town. The sense of a seafaring village & water are always present in this sea captain's house. Stand in the cupola & gaze over village, river & harbor to beyond Watch Hill passage & Block Island in one direction & Montauk in another. Radiant heating panels in each room with individual controls. Each room is prepared for your arrival with beds made & bath towels. Parking for 2 smaller cars on grass drive. Others may park on side street adjacent to house. Salt, pepper, sugar, flour, variety of spices. Functional, well designed & equipped. 5 burner gas cooktop, double convection oven, dishwasher, cookware & utensils. Cozy corner with Vermont Castings gas stove and adjacent table for 2 is ideal for morning coffee and reading. Covered porch adjacent to kitchen with dining for 4 and immediate access to garden, additional seating for 8, patio & gas grill. For HomeAway & VacationRentals, be sure to hover over the amenities with the ....for further information. * Kitchen is bright, functional & well equipped. Appliances include a Thermador 5 burner gas cooktop, Bosch double oven, SubZero refrigerator & freezer, dishwasher, food disposer as well as necessary small appliances. It is also well fitted with cookware, utensils & dinnerware. * Please note the maximum we can sleep is 12. The house is most comfortable with 8-10 in the 5 BR's with private bath on the 2nd floor. * Bikes are available to rent at Mystic Bike Rentals or Mystic Cycle Center and kayaks at King Cove Marina. Wonderful historic home full of charm and comfort. The place was fantastic for our family during my son's wedding weekend in Mystic. Conveniently located and large enough to easily accommodate a large family. Located perfectly for a walk to town and the church! We love Mystic and would return to this home. Would recommend to all that want to experience old nautical Mystic charm. A group of friends rented the house for a long birthday weekend. The house was perfect and located within a quick walk of downtown Mystic. We had beautiful weather and were able to sit outside on the back lawn and porch. The bells from the nearby church were great, even the concert on Saturday night. The kitchen has all of the cooking tools you cold possibly want. We will definitely be back. Beautiful home located walking distance from shops and restaurants. Great back porch and yard. Enjoyed our stay very much! Wonderful house and perfect location for exploring Mystic. We plan on returning for another family reunion. 1853 Captain Wheeler is worth it! Our week in this incredible home was nothing short of spectacular. The most well equipped vacation rental we have ever experienced in 30 years of renting. The close proximity to the Mystic village is ideal for every evening strolls, choices of historical venues, eating and drinking, it has it all. every hour you are delighted to hear the church bells toll and on Sunday from 9:00-9:30 am they wake the village with beautiful chimes. Although no AC, the owner has it figured out on air flow and plenty of fans. Worth the visit and more. We look forward to your family's return visit to explore and enjoy more of the area. There is some history to the lovely church bells. The tower blew off in the 1938 hurricane and the church was without one until a new steeple with carillon was erected in 1969 with the help of generous donations by members of the community. new meets old - very comfortable historical home! From the beautiful and varied flowers in the yard, to the cupola with a wondrous view over the river, this large home with a bathroom for each of the 5 bedrooms on the second floor and large, gracious living areas on the first, set in the heart of Mystic, meets and beats every expectation. Based upon our well traveled family's own truly memorable experience, we heartily recommend it to any visitor. Thank you for taking the time to review your visit to Mystic and the 1853 Captain Wheeler House. We are pleased that you enjoyed our home and garden, and found it well located for your Mystic activities. Your recommendation to other visitors is appreciated as we strive to have guests enjoy their stay in this wonderful historic area. Our peaceful, friendly neighborhood of historic homes & gardens is a short walk to the village. Mystic is midway between Boston & New York via I95 or Amtrak train. Ferry to Fisher's & Block Island or Orient Point from nearby New London. Two well provisioned grocers and numerous specialty food shops offer basics and delicious prepared food selections. Top-notch restaurants for most culinary yearnings including some of the freshest local seafood. The loved independent bookstore, local coffee shops, ice cream offerings, art galleries, gift and apparel shops share Main Street with eateries. A short walk to Mystic Seaport Museum and its varied activities is a highlight. Be sure to enjoy the restaurant, marine art gallery and restaurant. There are many attractions & things to do for all. A perfect getaway for family reunions, wedding celebrations or gathering with friends. Enjoy the nautical charm of this historic New England village with excellent food, wine, shopping, cultural & recreational opportunities. Spectacular, romantic 'lantern' room has views to Montauk, Watch Hill & Block Island. An area rich in history, seafaring, shipbuilding, art & architecture. Other Activities: ALL SEASON activities include Gardens in spring bloom, US Coast Guard Academy, June Sea Music Festival & Wooden Boat Show at Mystic Seaport, July 4th celebrations, Mystic Outdoor Art Festival in August & Taste of Mystic in September. Enjoy Mystic Seaport Museum & explore at Mystic Aquarium. Shop Olde Mistick Village, Visit the Mashantucket Pequot Museum, Nathanial Palmer National Historic Landmark in Stonington, Florence Griswold Museum & Lyme Artist Colony, the Submarine Force Museum & Nautilus. Eat at Mystic Pizza! Tour the Vineyards & taste Wine! There are many more! Please visit MysticVacation. 3 night minimum. 4 night minimum Summer, Holidays, Graduations. 4:00 pm Arrival and 10:00 am Departure. For the 3 or 4 night minimum rental, guest may opt for either a 2 night/3 day stay or a 3 night/4 day stay with 2:00 pm Arrival and 6:00 pm Departure. A 3% (domestic) payment processing fee will be added to the listed rent in the payment request to cover the HomeAway mandated HomeAway Payments cost. Rates/8 Guests. The rate per night per additional guest applies to the full rental period, NOT to any guest's partial stay within the rental period. Daily Rate stated applies ONLY to minimum stay days. Stays in excess of the minimum days noted will be prorated on the weekly rate. Refundable damage deposit $750 / 8 guests. $1000 / 9+ guests. Owner's Cancellation Policy. Please ask the owner or check their rental agreement when booking the property.